Medical school loans are a major consideration for most young physicians. Medical school tuition is costly, and few medical students have time for jobs that can make a significant dent in the overall cost of the four years of medical school education. Some students receive help from parents, but realistically, few parents can help with costs that run between $45,000–$80,000 per year. 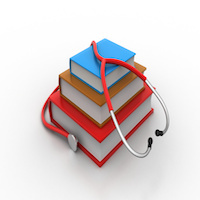 Most students pay for medical school tuition with loans and the idea that four years of loans can be relatively painless to pay back with income from a long career in medicine, and, as most students realize, the income of a physician is enough to make the additional educational cost worth it, but not enough to make it painless. Students often weigh the option of loan forgiveness programs in contrast to paying back loans and accumulating interest. It is worthwhile to investigate loan forgiveness programs as an option for paying for medical school education. There are a number of state and federal programs that provide loan repayment and loan forgiveness plans for physicians’ medical school education costs. Some grant loan repayment for physicians who work in areas that lack access to medical care, while others are based on academic achievement, special interests, or personal characteristics. Criteria and types of awards are varied. For example, two very different programs with very specific criteria could be great for certain students, but, because of the specificity of the requirements, would not suit every physician or medical student. One example, the Dr. James Hutchinson and Evelyn Ribbs Hutchinson award, is granted to medical students who went to high school in San Mateo County or Santa Clara County and is based on an assessment of personal integrity and financial need. Another example, the Public Service Loan Forgiveness Program is a federal program that provides forgiveness for the remaining balance of student loans that are under the Direct Loan Program or consolidated into the Direct Loan Program. With this particular loan forgiveness program, the physician must have already made 120 payments toward the balance while working in a public service position. Do you Pay Taxes On Student Loan Forgiveness? Most likely, yes. The vast majority of programs that repay loans officially report it to the IRS, and taxes must be paid on the amount that is repaid. This is important to keep in mind, and to begin setting aside funds to pay the taxes when due. There are excellent resources that can provide more information. The Association of American Medical Colleges (AAMC), for example, has a list of programs, most of which are state specific. Each program has its own specifications for application that may include essays, letters of recommendation, demonstration of financial need, or a commitment to full-time professional service in a designated setting. The rules and regulations regarding the terms of loan forgiveness can seem complicated. A government website, Federal Student Aid, addresses legal and other questions that are common to most student loan forgiveness programs. Each program has its own rules, such as how many installments will be paid, whether money will come directly to you or to your lender, and whether you could lose the benefits or owe a fine if you switch jobs or medical specialties. Unfortunately, where there is money, there is dishonesty. There is a whole page on the Federal Student Aid website which provides information about avoiding student loan scams. If you are considering loan forgiveness or loan cancelation programs, it is a good idea to confirm the validity of the program with a bank or with medical school, especially if asked to provide personal identifying information. Sometimes, loan repayment programs require that you do not earn more than a certain amount of income, and may not allow moonlighting or other work. Be sure to check the fine print, especially if you are in a specialty that offers plentiful opportunities for moonlighting, medical-legal consulting, or other side jobs. No, student loan repayment programs and medical education repayment programs only pay back student educational loans. They do not cover the cost of medical education for those who have already fully paid tuition. No, not all loans are eligible for every type of repayment plan. This is a recurrent theme that comes up when looking at the different programs. Only some loans are eligible, and that is usually spelled out in the terms of forgiveness or repayment program. If you took a loan from family members, for example, or if you used a personal loan to lock in an advantageous interest rate, these might not qualify. It's important to obtain the information up front before making decisions about things like moving to an underserved area or selecting a specialty.